BRAD WEISMANN: NRR Project: 'Life Ev'ry Voice and Sing,' the "Black National Anthem"
NRR Project: 'Life Ev'ry Voice and Sing,' the "Black National Anthem"
More than 100 years after its composition, 'Lift Ev'ry Voice and Sing' still has the power to provoke. Now this is an anthem! (In fact, Johnson himself referred to it as a hymn, as he thought the descriptor “anthem” was too divisive.) Phrased in King James style, it states the plain, bitter truth about everything African-Americans suffered. In fact, many times the second verse, with its mentions of the “chastening rod,” “hope unborn,” and “the blood of the slaughtered,” is omitted. It’s not just a prayer, but a dialogue with God, and in that bears resemblance to Jewish prayer. It implies an active and dynamic relationship with the powers above. Its frankness commands attention. The third version is for me the most affecting. It’s a simple, straightforward approach by jazz great Rene Marie, accompanied only by piano and drum set, and she sets Johnson’s words to the tune of “The Star-Spangled Banner.” This is what she did on July 1, 2008, to open Denver’s mayor’s annual State of the City address. 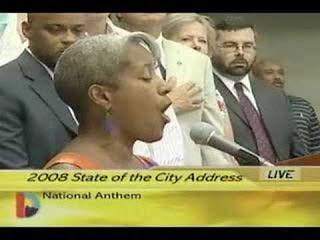 By imposing the lyrics on a national anthem so familiar we sometimes take it for granted, Marie recontextualized the words of Johnson’s poem and made listeners think, pointing out the cognitive dissonance of “Banner”s message about “the land of the free” that necessitated the concept of a second, black national anthem in the first place. Many were offended by Marie’s performance, and her unapologetic attitude about it. Few like to have their awareness ruffled unless they are prepared for it. The singer defended herself ably, reminding interviewers that Francis Scott Key, lyricist of the National Anthem, was a slave-owner and abolitionist-fighting lawyer. “As for offending others with my music, I cannot apologize for that. It goes with the risky territory of being an artist,” she wrote.